Good relationships can take some damage; this applies to friendships and romantic relationships as well. And it certainly can (and must) apply to marriages. This bridge is made entirely of wooden beams, many of them redundant. If one cracks or rots, the structure will say intact. In fact, the functionality of the bridge will most likely not suffer at all. (I'm no engineer, but stick with my metaphoric physics, if you will.) 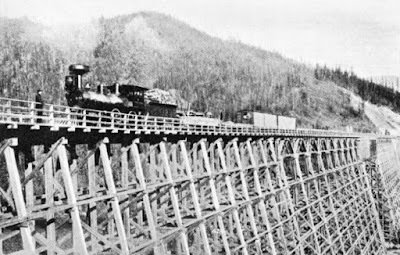 And if, especially back when a bridge like this was built, the beam was unreachable, things would have to just go on as they were -- which they could safely do. Too many relationships fail because of an event or a statement. Or even an action, Sure, one can simply set fire to the bridge (a spouse commits infidelity or becomes abusive, for instance) and it can all burn down. But disappointments -- even very big ones -- in the actions or words of our friend or lover or spouse, while they may permanently break one or two of the beams, need not necessarily compromise the whole structure. I think it is okay to have unmendable breaks in a relationship. Just because there is something within that can never be fixed, it doesn't mean that the numerous other good components can't take the stress until death do we part. And it doesn't mean we can't walk life's walk happily, together.